Manufacturing is critically important to the American economy. For generations, the strength of our country rested on the power of our factory floors—both the machines and the men and women who worked them. We need manufacturing to continue to be a bedrock of strength for generations to come. Manufacturing is woven into the structure of our economy: Its importance goes far beyond what happens behind the factory gates. The strength or weakness of American manufacturing carries implications for the entire economy, our national security, and the well-being of all Americans. Manufacturing today accounts for 12 percent of the U.S. economy and about 11 percent of the private-sector workforce. But its significance is even greater than these numbers would suggest. The direct impact of manufacturing is only a part of the picture. First, jobs in the manufacturing sector are good middle-class jobs for millions of Americans. Those jobs serve an important role, offering economic opportunity to hard-working, middle-skill workers. This creates upward mobility and broadens and strengthens the middle class to the benefit of the entire economy. What’s more, U.S.-based manufacturing underpins a broad range of jobs that are quite different from the usual image of manufacturing. These are higher-skill service jobs that include the accountants, bankers, and lawyers that are associated with any industry, as well as a broad range of other jobs including basic research and technology development, product and process engineering and design, operations and maintenance, transportation, testing, and lab work. Many of these jobs are critical to American technology and innovation leadership. The problem today is this: Many multinational corporations may for a period keep these higher-skill jobs here at home while they move basic manufacturing elsewhere in response to other countries’ subsidies, the search for cheaper labor costs, and the desire for more direct access to overseas markets, but eventually many of these service jobs will follow. When the basic manufacturing leaves, the feedback loop from the manufacturing floor to the rest of a manufacturing operation—a critical element in the innovative process—is eventually broken. To maintain that feedback loop, companies need to move higher-skill jobs to where they do their manufacturing. And with those jobs goes American leadership in technology and innovation. This is why having a critical mass of both manufacturing and associated service jobs in the United States matters. The “industrial commons” that comes from the crossfertilization and engagement of a community of experts in industry, academia, and government is vital to our nation’s economic competitiveness. 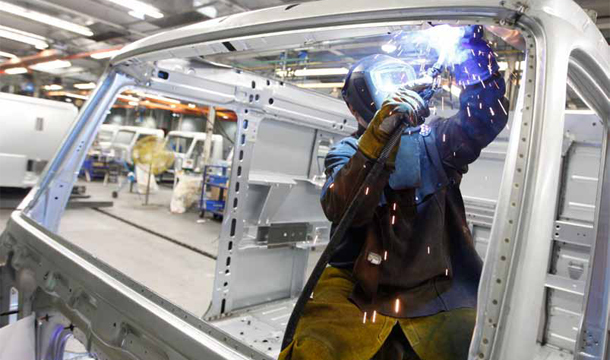 Manufacturing also is important for the nation’s economic stability. The experience of the Great Recession exemplifies this point. Although manufacturing plunged in 2008 and early 2009 along with the rest of the economy, it is on the rebound today while other key economic sectors, such as construction, still languish. Diversity in the economy is important—and manufacturing is a particularly important part of the mix. Although manufacturing is certainly affected by broader economic events, the sector’s internal diversity—supplying consumer goods as well as industrial goods, serving both domestic and external markets— gives it great potential resiliency. Finally, supplying our own needs through a strong domestic manufacturing sector protects us from international economic and political disruptions. This is most obviously important in the realm of national security, even narrowly defined as matters related to military strength, where the risk of a weak manufacturing capability is obvious. But overreliance on imports and substantial manufacturing trade deficits weaken us in many ways, making us vulnerable to everything from exchange rate fluctuations to trade embargoes to natural disasters. None of this matters, of course, if American manufacturing is too far gone to save. But American manufacturing is, in fact, a success story and it is not a story approaching its end. Notwithstanding employment losses and the relative rise of manufacturing in other countries, the United States led the world in manufacturing value added in 2008. Moreover, the United States ranked third in manufacturing exports in 2008, behind only China and Germany and ahead of Japan and France. The United States will never again dominate world manufacturing the way it did in the decades immediately following World War II (in fact no country is likely to ever do so again, barring cataclysm) but manufacturing is, can, and should remain an important part of our economic future. There are many other players in the game now but that doesn’t mean America must leave the field. The purpose of this report is to examine where the United States remains competitive in manufacturing at home and abroad. But we begin our analysis by detailing why manufacturing remains so important to our economy, our society, our national security, and our ability to remain the world’s science and innovation leader in the 21st century. Then we look at our domestic manufacturing base and our top manufacturing export sectors to gauge where U.S. manufacturing remains competitive. This report does not, it should be said up front, outline a manufacturing policy agenda. There is a broad range of views on what U.S. policy toward manufacturing should be. Some believe, although most say this quietly, that U.S. manufacturing is a lost cause and, as such, should be abandoned. Others, however, see U.S.-based manufacturing as of continuing importance. These people argue that our relatively high labor costs and the growth of manufacturing elsewhere do not sound the death knell. They see our nation as still a great manufacturer. But even among those who still believe in manufacturing, there is a wide range of views on what should be done to nurture it. There are those who see free trade agreements as a way to help manufacturing by boosting exports and those who see those same agreements as subjecting U.S. manufacturers producing for the U.S. market to unfair competition. There are those who see the need for “industrial policy”—a concerted effort to focus our national resources on industries that we believe will be the key manufacturing areas of the future—and those who see any attempt by the government to “pick winners and losers” as foolhardy and doomed to misallocate economic resources and thus undermine the efficiency of our economy. Other policy issues include the importance of investing in human capital to make U.S. workers more productive, investing in basic research so the big new ideas come from the United States, and a range of assistance that can be provided to manufacturing facilities and corporations. Michael Ettlinger is the Vice President for Economic Policy and Kate Gordon is the Vice President for Energy Policy at the Center for American Progress.